By calculating the tension and distortion of the elements composing the bipolar prosthesis under extreme conditions encountered in real life using a special post-processing program, we established the variation curves of the contact pressure at the hip bone-cup, armor-cup and cup-femoral head interface. By comparing the data obtained from all the examined cases, important conclusions were drawn regarding the influence of tension and pressure distribution on the structural integrity and biomechanics of the prosthesis, as well as the acetabular wear and tear, in order to assess its reliability. The experimentally determined tension and distortion status at the acetabular bone-metal armour interface, lead to the wear and tear phenomenon, which can be explained by three mechanisms and theories incompletely reflecting the overall process. The histopathologic study of the acetabular bone tissue using FEM (finite elements method) on surgically removed specimens will probably lead to the identification of a series of factors that could reduce the rate of the wear and tear process. Introduction. The presence of Reed-Sternberg malignant cells is absolutely necessary for Hodgkin's lymphoma diagnostic, but it is not always sufficient because can be observed Reed-Sternberg-like cells in other malignant and benignant diseases, too. The CD30 expression at Hodgkin and Reed-Sternberg level can give us supplementary information in differential diagnostic and can be used as progressive disease factor. Material and methods. Our study was composed from 63 cases histopathological diagnosticated with Hodgkin's lymphoma and hospitalized in Hematology Department of County Hospital Timisoara. CD30 expression was immunohistochemical semi-quantitative evaluated using clone BerH2 as primary antibody and APAAP-New Fuchsin as visualization system. Results and discussions. The increasing of CD30 expression occurs in the same time with advanced stages and the disease progression (p<=0.001). For I and II stages CD30 expression does not overcome (-/+) category while the III and IV stages, all the cases are situated in (+/-) and (+) categories. No connection can be noticed between histological type and CD30 expression (p<=1). We consider that using this staining, although less used in Romania, must be done in all Hodgkin's lymphoma and Hodgkin's lymphoma-like cases. We say that because the main cause of relapses is represented by inadequate clinical staging and diagnostic. Conclusions. In our study, the increasing of CD30 expression is associated with advanced disease stage. We recommend reinvestigating and restaging all cases that was included into an incipient stages and they have a CD30 expression situated in (+/-) and (+) intervals because some lymph nodes could be overlooked. Frozen section examination is aimed at making a preoperative diagnosis, determining the benign or malignant nature of a breast lesion, but also the most suitable surgical procedure. The sensitivity and specificity of this method and the causes of discrepancies were analyzed in a retrospective study of 2177 breast lesions. Method. 1150 frozen sections from 2177 breast lesions were performed in the interval 1999-2005. The sections made at the open door cryostat and measuring 5 micro-m were stained with rapid Hematoxylin-Eosin. The following terms were used for describing the intraoperative diagnosis: negative, positive, and await paraffin section. After the frozen section diagnosis was made, the frozen tissue was thawed to room temperature and fixed in formalin overnight for further paraffin processing. The remaining unfrozen tissue was processed into a paraffin section. Results. The number of cases and the number of frozen sections increased from 1999 (341 cases, 87 frozen sections) to 2005 (441 cases, 220 frozen sections). Mean sensitivity (a/a+c) was 94%, and mean specificity (d/b+d) was 99%. The false positive cases accounted for 0.08%, while the false negative ones for 2.26%. In 7% of the cases, the diagnosis could not be made on frozen section. Conclusions. Despite the raging popularity of aspiration cytology, frozen section still stands out as the method of choice for rapid diagnosis. Frozen section is not indicated to be performed on mammographically detected lesions, small lesions, papillary lesions, proliferating fibrocystic disease, or tubular carcinoma. Sarcomas are relatively uncommon tumors, accounting for 1% of all malignancies. Sarcomas are commonly classified according to their site of origin: soft tissues or bone. The purpose of the clinic study was to focus the symptoms and the clinic signs. The radio-imagistic study is essential in the evaluation of the maxilla tumors. The histopathologic study was done to determine the histological type, the differentiation level, the invasion level as well as the presence or absence of the metastases in drainage ganglia. The correlation of the findings of this study leads to a clear and correct clinic diagnosis, an adequate local or general therapy and a prognostic. The diagnostic role of imaging is essential and often permits the orientation to benignity or, on the contrary, requires biopsy if the image is an aggressive one or of uncertain nature. Advances in diagnostic imaging have contributed substantially to the management of tumors. The strong collaboration among the physician, imagist and anatomopathologist serves the patient's benefit. The present study was made in the anatomy laboratory on 100 heart specimens. It was studied the morphological parameters about diameter and number of the atrial orifices of the pulmonary veins. The number of the orifices and their diameter depends on the lungs weight. Generally (70% of the cases), the orifices number is four and rarely three or five. An increased number of orifices are more frequently in the right side and a decreased number especially in the left side. The orifices diameter is much larger at the male's veins than the female's ones, and much larger in the right than the left side and also much larger at the superiors than the inferior veins. This paper analyzes 18 endometrial carcinomas with different degrees of differentiation, the objective being to estimate involvement of p53 oncoprotein in the mechanism of endometrial carcinogenesis and the possible correlations with the tumoral proliferative activity evaluated by PCNA. The p53 immunoexpression was positive in 44.4% of the studied endometrial carcinomas, divided in three groups, the intensity of the immunostaining for p53 being increased for the low differentiated and undifferentiated endometrial carcinomas, whereas the differentiated endometrial carcinomas were moderate or low p53 positive. All the investigated tumors were PCNA positive, the PCNA index being of 40% in well-differentiated carcinomas, while in low differentiated and undifferentiated endometrial carcinomas the medium values of PCNA were of 60%, respectively 85%. Correlating the p53 and PCNA findings, we noted that PCNA was expressed especially in the cases with increased proliferative activity, without a significant statistic correlation between p53 and PCNA expression. The aim of our study was to evaluate the prognostic significance of p53 protein immunoreactivity for prostate cancer and to determine whether p53 immunoreactivity correlates with the Gleason tumor grade in primary adenocarcinoma. Prostate fragments were fixed in 10% formalin, paraffin-embedded, sectioned and standard Hematoxylin-Eosin stained, then examined using histological grade (Gleason system). P53 expression was studied using immunohistochemistry with monoclonal antibody anti-p53, 1:100 (BIOX) on tissue samples obtained during transurethral electroresection, adenomectomy or needle biopsy in 30 patients with prostate carcinoma: group 1 (n = 7) Gleason score 5, group 2 (n = 10) Gleason score 6, group 3 (n = 11) Gleason score 7, group 4 (n = 2) Gleason score 8. Also, we noted the cases with high grade prostatic intraepithelial neoplasia (high grade PIN). All specimens prior to initiation of any treatment were submitted for this study. Staining was defined as positive for p53 whenever any specific nuclear staining was detected. We considered tumors to overexpress p53 protein only when strong nuclear staining was present. Cases exhibiting weak or equivocal nuclear staining were classified as negative, as were cases with extremely rare isolated positive nuclei. A semiquantitative scoring system was employed to assess the level of p53 reactivity. Six of 17 (35.2%) moderately differentiated tumors (Gleason score 5-6) and five of 13 (38.4%) moderate to poorly differentiated (Gleason score 7 and above) revealed strong nuclear positivity for p53. In addition, we noted occasional p53 reactivity in high-grade PIN. Conclusions. We interpret these data to demonstrate a positive association between p53 reactivity and higher Gleason grade tumors; p53 might be an independent prognostic indicator among metastatic risk cases. The squamous cell carcinoma of the lip has a metastasizing potential by lymphatic or/and sanguine ways. Objective. Knowing the profile of the squamous cell carcinoma of the lip with a high degree of metastasizing. Patients and method. We have analyzed on a group of 322 patients the influence of the degree of the histological differentiation of the tumor and the influence of the seriousness of the invasion over the metastasized potential. The biopsic fragments have been processed according to the usual histological technique paraffin embedding, and the sections have been colored with Hematoxylin-Eosin. Some of the cases have been immunomarked, to confirm the diagnosis, with antibody anti-cytokeratins, anti-vimentin, anti-protein S100 and anti-alpha actin. Results. 12.24% of the patients with tumors with Broders II degree, 28.5% of those with Broders III degree and 52.94% of those patients with Broders IV degree presented metastasis, that show that the incidence of the regional ganglionary metastasis is higher in the case of the tumors with a low histological differentiation (test chi-square, p<0.001). 1.88% of the patients with an invasive squamous cell carcinoma under 6 mm and 38.60% of those with tumors of over 6 mm presented metastasis, that show that the risk of metastasizing is higher when the profoundness of the invasion is over 6 mm (test chi-square, p<0.001). In two cases we faced the changing of the malignity degree, meaning that it got worse passing from the Broders III degree (primary tumor) to Broders IV degree (relapse of the tumor). Conclusions. The histological differential degree of the tumor and the profoundness of the invasion are two important parameters when shaping the profile of the squamous cell carcinoma of the lip with a high degree of metastasis. The degree of malignity of the tumor may worsen during the evolution of the lip cancer, raising the risk of metastasizing as well. The aim of our research is to make a micronatomical evaluation of the ratios of the structural elements of the oesophagus muscular tunic and suggest a new perspective in the general knowledge about this tubular organ. The visualization of the structural elements was done using classical microanatomical methods Hematoxylin-Eosin for general orientation, Van Gieson for picrofuxinophile collagen fibers and Gomori for reticuline fibers. The neurofilaments were identified using silver impregnation on Cajal block. The examination of the sections was made with the Nikon Eclipse 600 photomicroscope. The images were taken and processed using a computer with LuciaNet licensed Microsoft. The co-existence in the architecture of the oesophagus of two microcinematic systems structurally divergent, but functionally convergent represents microanatomical arguments for the nomination of a new type of muscles - the oesophageal muscle - anatomo-functionally different from the skeletal striate muscle, from the smooth visceral muscle, from the cardiac muscle or from the embryonic type muscle of the excitoconductor system. The extra cellular matrix of the muscular tunic of the oesophagus contributes to the organization of the endo- and peri-misium, as well as to the three structures involved in the biomechanics of the oesophageal muscle: the connective-vascular septa, the microtendons that have in their structure receptors of the peristaltic reflex and, finally, the lamina propria mienterica strewed with numerous neuronal structures. The co-existence of the stereo-distribution of the monostructured fascicles (skeletal muscular fibers or smooth muscular cells) with bistructured fascicles (skeletal-smooth) gives the oesophagus a heterogeneous architecture. Lamina propria mienterica, which realizes the border between the circular and longitudinal strata, contains two neuronal structures of its own, but anatomically inserted the neural mienteric plexus, which is equivalent to the Auerbach plexus and the neuroganglion of the mienteric plexus, equivalent to the visceral neuroganglion Cajal-Retzius. Efforts in perfecting the methods of early diagnosis, in trying to assess premalignant conditions, and in properly staging malignant tumors are still in trend. The geographic area around Timisoara (Banat Region) is situated on the first place in the country as far as the gastric location of cancer is concerned. The authors aimed to deal with the initial stage in the development of gastric cancer, a stage that has been oncologically termed "precancerous damage", and with the neoplastic invasion of the gastric wall. 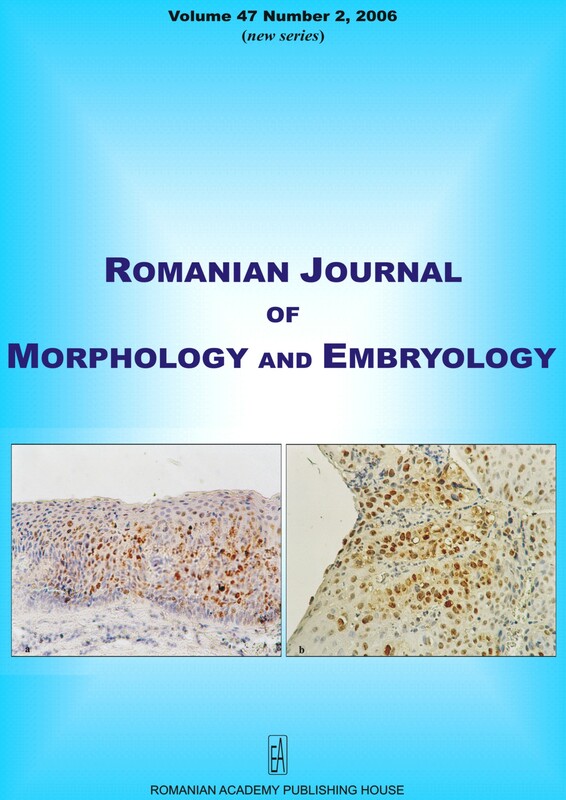 The present paper is based on the 1995-2005 statistics of the IInd Surgical Department of the Timisoara County Hospital, the study group consisting of 802 patients admitted for gastric disorders, 522 of which being later diagnosed with a tumoral pathology. Routine morphological tests were conducted on biopsy pieces dye stained with Hematoxylin-Eosin, standard technique, the van Gieson trichromic staining, the Giemsa staining, the AA-PAS staining and the immunoreaction methods. The age for gastric tumoral pathology ranged between 36-88 years in females, and 31-87 years in males. Most gastric carcinomas are adenocarcinoma, 404 (90%) cases - could be classified as follows: 167 cases of tubular adenocarcinoma; 39 cases of papillary adenocarcinoma; 24 cases of mucinous or colloid adenocarcinoma; 141 "signet ring"-cell carcinoma; 33 cases of undifferentiated carcinoma. Currently there is an increase of the incidence of the "diffuse"-type in women and at younger ages. Attention should be given to precancerous conditions; there was a large number of premalignant or potentially malignant gastric damage: atrophic chronic gastritis (54 cases), intestinal metaplasia (104 cases), and gastric dysplasia (104 cases). Objective. We investigated the proliferative activities in premalignant laryngeal vocal chord lesions treated by epithelial stripping in microlaryngoscopy, using immunohistochemical staining with anti-p53, anti-PCNA and anti-Ki-67 monoclonal antibody and we correlated with clinic and morphologic aspects. Material and methods. The study was made on 32 patients hospitalized in Craiova ENT Clinic in 2005 presenting lesions precursor to vocal cord malignity. The lesion's aspect was observed using suspended microlaryngoscopy, a biopsy was performed and biological tests were examined from a pathological and immunohistochemical point of view, with the investigation of the following immunohistochemical markers: Ki-67, PCNA and p53. Results. Thirteen cases (41%) presented red hypertrofic chronic laryngitis, seven cases (22%) presented white hypertrofic chronic laryngitis, and 12 cases (37%) presented papillomas with simple, moderate, severe dysplasia and in situ carcinoma in 62.5%, 22%, 12.5% and, respectively, 3% of the cases. All the dysplasic lesions, no matter the dysplasic degree, have presented alteration of both surface eplitelium and chorion. The expression of Ki-67, PCNA and p53 was correlated with the dysplasia's degree in various proportions. Conclusions. In clinical practice, morphological grading of dysplasia is difficult to evaluate. The Ki-67 and PCNA markers were correlated with the dysplasia degree; the expression of p53 was present only in 28% cases with moderate dysplasia and in one case with in situ carcinoma. A set of 50 cases of urinary bladder tumors in patients predominantly resident in BEN area was histologically investigated again, in order to establish new prognostic factors. Histological type, histologic stage and invasive pattern were correlated to immunohistochemical determinations. Determinations of C-erb B2, pRb, p53 and Ki67 were performed and aggressivity degree and proliferation and prognostic indice were also established. In the real life, the leg and its skeleton are supposed at the most diverse stresses. It is known that the human bone is one of the most important natural composite materials. The paper presents a method of study and the steps to obtain the virtual bones of the human body, method applied to tibia bone. For that purpose was used a CAD parametric software which permits to define models with a high level of complexity. To obtain the bone cross sections of the tibia bone a Computer Tomograph was used. The obtained 3D model is studied using the finite element method, taking into consideration the real structure of the bone and the mechanical characteristics of cortical and spongy, and we can obtain the stresses distribution for different solicitations. Retroperitoneal synovial sarcomas are very rare. The authors describe a 39-year-old male with a primary retroperitoneal synovial sarcoma showing a monophasic pattern. Immunohistochemically, the tumor cells were positive for cytokeratin AE1/AE3, epithelial membrane antigen, vimentin, S-100 protein, CD99 and calretinin. The differential diagnosis, clinical evolution and principles of treatment are shortly discussed. Intussusception of the appendix in adult represents an uncommon entity. We report a 54-year old woman who underwent an appendectomy 24 years previously and who was hospitalized for changes in bowel habits and periumbilical and epigastric pain. A sessile polypoid tumor of cecum was discovered during colonoscopy, which was removed. Histopathological examination showed that it was the case of an inverted appendiceal stump. Authors present reviews of the literature concerning clinical features, associated conditions, diagnosis, classification and therapy of this extremely rare condition. During educational dissections at a human adult specimen, male, a complex picture of anatomical variants was encountered. Bilateral doubled renal arteries were found: on the right side superior hilar and inferior hilar renal arteries and on the left side superior hilar and inferior polar renal arteries. All these renal arteries emerged from the abdominal aorta. Also, bilateral doubled testicular arteries were found. On the right side, the medial testicular artery emerged from the abdominal aorta while the lateral testicular artery left the superior renal artery. On the left side, the lateral and medial testicular arteries emerged as a common trunk from the abdominal aorta. This trunk originated from aorta behind the left renal vein and arched over that vein to descend and to divide in front of it. The two kidneys were keeping a fetal aspect, lobulated, more obvious on the left side. The right hepatic artery was found originating from the superior mesenteric artery; it coursed posterior to the portal vein and was sending the cystic artery. The right gastric artery emerged from the initial segment of the gastro-duodenal artery. Even though some morphological and topographical aspects regarding this complex anatomical variation have been described, it seems that the bilateral presence of doubled renal and testicular arteries has not been reported. The left testicular trunk arching over the left renal vein must be considered when discussing the nutcracker syndrome. During diagnostic and surgical approaches at the levels of the renal, gonadal and hepatic vessels, associations of anatomical variants and the bilateral presence of these must be suspected. The Laboratory of Pathology of the actual "Professor Ion Chiricuță" Oncological Institute of Cluj-Napoca, former "Iuliu Maniu" Institute for Cancer Study and Prophylaxis, had the privilege that in its framework carry on an important part of their activity professors Titu Vasiliu and Rubin Popa, who are forming, beside Victor Babeş, the golden trinity of the Romanian pathology. The Cancer Institute of Cluj, one of the first in the World, was founded in 1929, especially by the clear-sightedness and the efforts of Professor Iuliu Moldovan, the master of the modern Romanian school of hygiene. The clinic division was assisted by a Laboratory of Pathology, whose chief was appointed the young pathologist of high competence, Rubin Popa, associate Professor of this department of the Cluj School of Medicine. In 1942, he became director of the Institute, function accomplished until his premature disappearance in 1958. Titu Vasiliu worked in the Oncological Institute from 1949, a year after his forced retreat from the chair of pathology, up to 1958. Fortunately, his premature disappearance did not interrupt the activity of the laboratory, because the management of the Oncological Institute was committed to Ion Chiricuță, an experimented and modern surgeon of Bucharest. From 1960, the Laboratory of Pathology has been led by Professor Augustin Mureşan, an experimented, rigorous and prudent pathologist, who has imprinted these indispensable qualities to his disciples learning under his leadership. The activity of the laboratory has been very favorably influenced by the presence of Professor Gheorghe Badenski from the Department of Microbiology. The collaboration with Professor Eugen Pora from "Babeş-Bolyai" Department of Animal Physiology and his disciples, Virgil Toma, Draga Nestor, Sena Roşculeț, Carmen Stugren and Georgette Buga has carried on the performance of interesting works concerning the thymus involution in tumor-bearing hosts and its signification for the depressed immunity in the advanced stages of cancer. In the same direction, the behavior of mast cells has been studied in collaboration with Professor George Csaba from the Budapest Medical University Department of Biology. The observations brought about were remarked by the Canadian scientist Hans Selye. Most of these works have been included in the book "Immunity and cancer", distinguished with "Victor Babeş" Prize of the Romanian Academy.